Kershaw, SC, April 14 - After top 5 finishes in Round 1 of the ASRA Team Challenge at Homestead/Miami in February, teams Jinba Ittai Motorsport (Joel Lenk), Grease Monkey Racing (Eric Helmbach/Stephen Hoffman) and #1 plate holder, LB Sport (Lloyd Bayley) descended on Carolina Motorsports Park this weekend to continue the scuffle to top the Team Challenge standings. The weather for the start hovered around 70 degrees with an eminent threat of rain. This might have deterred another kind of riders, but these steely-eyed motor men were eager for the challenge. The course was clear and dry at 12:05 PM when the grid rolled off to form the start. Joel Lenk got the hole shot at the green flag with Barry Motorsports (James Barry) and Stephen Hoffman in tow down toward turn one. 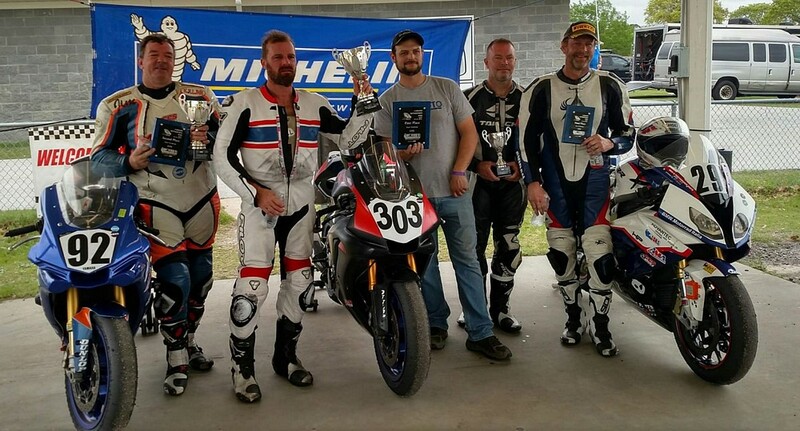 By lap two the Coleman Powersports Yamaha R6 (Greg L’Heureux/George Federlin/Tommy Wilson Jr.) was running second and J&J Performance (Jason Farrell) was third. On lap two Farrell had taken second place to Lenk. Coleman lay third followed by Ol Boys Racing (Julio Valette/Paul Guy/Gabriel Wingard) and Fast Lane Racing (Rick Beggs/Jason Gibbons/Bradley Moser). Bayley had moved through the pack up to sixth with Helmbach seventh and Barry eighth. Farrell was out front on lap three and the order remained the same for five laps as a light rain started. Farrell and Lenk battled back and forth for the lead until lap 17, when Farrell pulled into the pits for a failing front brake system. The team worked on the malfunction for four laps, but to no avail and rolled the entry to the paddock for a permanent retirement. With Joel Lenk out front, Lloyd Bayley was up to fourth place by lap 16, and 3rd place two laps later. The complexion of the race changed with a red flag on lap 21 when the Coleman Powersports entry went down in front of Bayley and the Ol Boys. On the restart Eric Helmbach took the helm of the grease Monkey entry and put the big BMW out front in short order. Lenk was second and Bayley third. Ol Boys, Fast Lane and Barry trailed. Two laps later Bayley’s Kawasaki was in second and as he started multi-lap charge toward the Grease Monkey BMW. After five laps patiently following Helmbach, Bayley made his move and opened a half-second per lap gap. By lap 41 the gap had stabilized at two seconds. There were a few late pitstops and the top riders briefly changed positions, Jim Barry briefly inheriting the lead while Bayley, then Helmbach returned from the pits. By lap 53 Bayley was back out front and things looked certain for Lloyd Bayley. He had the pace. But this is racing, and there was not enough luck in Lloyd Bayley’s account to finish on top. 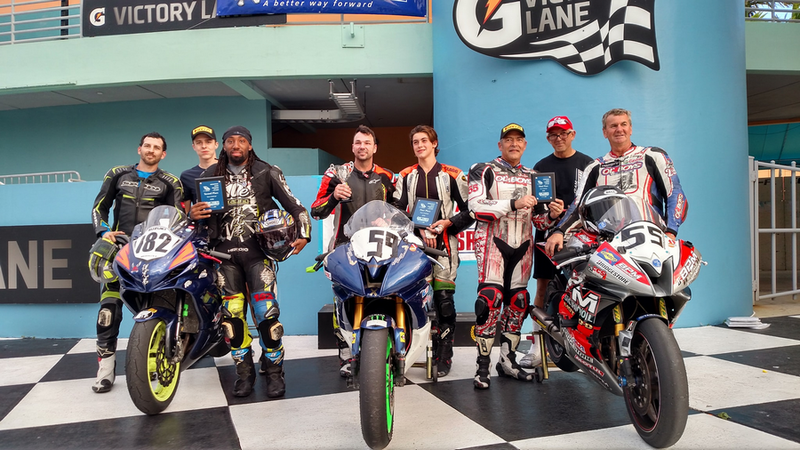 On the penultimate lap Bayley was charging down the back strait when the ZX10R lost power, cut out and died leaving Bayley trackside to watch Joel Lenk take the win, Jim Barry the runner up slot and Eric Helmbach round out the podium. For results click here and updated points click here.